Introducing the Next Fit Convertible Car Seat from Chicco, the makers of the #1-rated Key Fit. Engineered with innovative safety and convenience features, the Next Fit is the easiest convertible car seat to install simply, accurately and securely. The exclusive Recline Sure 9-position Leveling System provides the most recline options to accommodate a wider range of vehicles, and the Superrich LATCH tightener uses force-multiplying technology to help achieve a SUPER tight and secure vehicle fit with a fraction of the effort. Just like the Key Fit, two Ride Right bubble levels accurately indicate correct seat angle in both rear-facing and forward-facing modes. And, when youre ready to move to forward-facing, an integrated slide path makes it easy to re-position the LATCH strap without re-threading. 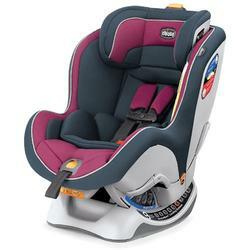 Other features include a removable infant insert for smaller babies, 5-point harness with 2-position chest clip, 6-position headrest with integrated harness adjust Ent, built-in belt lock-offs for installation with vehicle belt, and a removable cup holder for use on either side of the seat. For use with children from 5-40 lbs in rear-facing mode, and from 22-65 lbs in forward-facing mode.